One might ... maintain that modernity is indeed marked by the will toward totalization as much as it is metaphorized by the fragment. We have grown accustomed to conceptualizing the divide between modernisms and avant-gardes as one between recollection and rupture, epitomized in the ways in which their iconic works deal with increasingly uncontainable contents: a shoring-up of fragments against ruins, in T. S. Eliot's classic formulation, or a willful scattering of references across the surface of what no longer pretends to hold together, as in Dada sound poetry. On the one hand, a vertical aesthetic, which finds meaning for modernity in its recapitulation of the past; on the other, a horizontal one, which severs itself from the past and reconstitutes the present as a man-made constellation. These apparently opposed aesthetics have in turn divided scholars, requiring them to declare their allegiance to one mode or another and to declare their mode the dominant. But as Tom Gunning has recently argued ("Modernity"), the two modes-dispersal and containment-necessarily coexisted and played off one another in early-twentieth-century aesthetics, as disciplines adjusted themselves to the proximity of new media and the connected reshaping of the modern sensorium. Artworks, in other words, could choose either to open or to close themselves to the effects of modernity on bodies and language. Or, occasionally, to have it both ways at once, as Linda Nochlin argued in her now-classic study of modern art history, The Body in Pieces, which begins by placing its accent on an inconsolable nostalgia for the past and a modern dwelling amidst fragments, only to uncover hidden drives toward recuperation in the very works that seemed to most resist it. For those writers working in two or more cultural zones, it becomes more difficult to delineate their place within modernist or avant-garde aesthetics, for a number of reasons. First, the relationship to the past in a postcolonial setting is more than an issue of simple recuperation as it is for European writers. Second, both the fragment and its organizational opposite, the museum, signify quite differently in metropolitan and colonial contexts, involving in the latter not a violent shaping of a cultural heritage but a mode of precarious knowledge (Aguilar; Rosenberg). And third, the very fact of operating across cultural spheres means that a poet's language potentially changes its meaning in different contexts, whether through the poet's active choosing or the reader's interpretive paradigms. What comes into play, then, in our reading of modern postcolonial writers is the question of frames: deliberately imposed ones that may crop and contort, as in Nochlin's discussion, or delicately superimposed and juxtaposed frames that add nuance to our notion of multiple contexts. In the study that follows, I explore the writing of the Peruvian poet César Vallejo, whose writing was almost symmetrically divided between Peru and Paris-with two collections of poetry composed in each place-and whose poetry may seem to be split between avant-garde experiment and political commitment. As I argue throughout this book, these two modes are two sides of the same coin, and increasingly so in his Paris years. Although what may come to appear uppermost is the political charge of his later work, it is nowhere entirely free from a formal violence or fragmentation that mediates and mirrors the poetry's contents. And as I demonstrate over the course of the book's six chapters, the coherence of Vallejo's poetics lies in his deployment of what I call "body language"-a conjoined semiotics of word and gesture that develops and takes different forms over the course of his work, but which always foregrounds the activity of bodies attempting to articulate themselves in a shattered context. This often takes unexpected forms: his early Peruvian poetry, for instance, repeatedly stages the performance of a poet already expelled from local traditions, who reaches or calls out to others without managing to make his expressions hit home. And in the poetry he composed in Paris, Vallejo proves himself increasingly aware of the suffering bodies of others, of the violence being done to them by an official language that usurps their speech, but also of his lack of authorization to speak for them. Where he attempts to find a ground of commonality is precisely in the body: the sharing of basic physical processes of suffering and enjoyment, the investment in the possibility of a kinaesthetic empathy, but also the knowledge that we experience our own bodies and the bodies of others only in pieces. What Vallejo proposes in his poetry, I suggest, is an ethics of the fragment: not a celebration of the fragment on avant-garde terms, but a recognition of its centrality to modes of modern subjectivity and collectivism. Poetry in pieces, in other words, as the most responsible mode of lyric modernity. Todos somos provincianos, don Julio. Provincianos de las naciones y provincianos de lo supranacional. We are all provincials, Don Julio. Provincials of nations and provincials of the supranational. I open this study with a retrospective gaze to set the stage for different framings of Latin American writing. In the late 1960s a polemic erupted between the Argentinean Julio Cortázar and the Peruvian José María Arguedas over the question of how to represent Latin America in literature. The exchange took place in a moment that seemed to promise an effective intertwining of local aesthetics and global politics: the spread of international socialism in the aftermath of the Cuban Revolution, coupled with the growing visibility of Latin American writing through the international success of the formally experimental Boom novelists (Gabriel García Márquez, Carlos Fuentes, Mario Vargas Llosa, Cortázar himself). This critically timed exchange, between two of the continent's most prominent writers, offers a remarkable condensation of polemics over relations between the local and the international, immediacy and mediation, aesthetics and politics, which cluster around postcolonial writing in the twentieth century and which provide the backdrop and often the texture of this book. The opening salvo was Cortázar's response to Casa de las Américas director, Roberto Fernández Retamar, who had asked for an essay on the "situation of the Latin American intellectual," clearly hoping for a statement that would underline the nexus between the Cuban Revolution and continental literary experiments. Cortázar responded not with an essay but with an open letter, which allowed him-he insisted-to make his statements as a particular individual rather than as a representative type or authoritative voice. In this nuanced document, Cortázar explicitly resisted speaking as a "Latin American intellectual," emphasizing not only the separation of his aesthetic writings from his political beliefs, but his physical distance from events on the ground, given that he had been living in France since 1951. That distance, Cortázar suggested polemically, had allowed him to develop a more textured view of Latin America, through his greater access to a broad range of sources on what was happening in the world and at home and because in Paris he had come into contact with forms of international socialism. Writing and thinking at a distance from Latin America, he claimed, allowed him to avoid the consuming "challenge-and-response" of local events and to develop a more "planetary" view of the continent, without thereby moving in the direction of "diffuse and theoretical universalisms." Paris, in other words, had given him sufficient distance to see Latin America in its complexity without becoming bogged down in its details and, in the process, to develop a personal aesthetic that reached beyond local Argentinean literary concerns to encompass a more broadly international and humanist-inflected socialism. Arguedas encountered the letter as he was about to begin writing his most ambitious novel to date, El zorro de arriba y el zorro de abajo (The Fox from Up Above and the Fox from Down Below). His earlier novels had charted a progressively swelling terrain, from small towns in the Peruvian sierra to larger provinces to an all-encompassing vision of national tensions in the 1965 novel, Todas las sangres (All the Bloods). His latest project aimed to take on a categorically new space: the fishery boomtown of Chimbote, where rapid modernization was being carried out by local bodies and foreign capital, whose conflicting interests were resulting in unpredictable clashes. Attempting to capture this event in its unfolding not only entailed rethinking the ethnic makeup and local segregations of the nation as they re-presented themselves in this new coastal city but also prompted Arguedas to rethink the relationship between his work as an ethnographer and his practice as a novelist. This new novel, written haltingly, is divided between two alternating parts: on the one hand, a fictional narrative involving various representative types as they settle into precarious arrangements and new conflicts in Chimbote, pressured by the demands of industry, ethnic and class antagonisms, local politics, and neocolonial entanglements; on the other, a personal diary, which not only presents an agonizing self-critique but also assesses the work of contemporary Latin American novelists. It is in this context that Arguedas broaches the topic of his procedural discrepancy with Cortázar. His first diary counters Cortázar's perceived affront to localist aesthetics, insisting that a close-up focus on a local phenomenon such as Chimbote not only addressed immediate and geographically limited issues but also involved an engagement with the world. One could be a provincial of the nation, Arguedas suggested, without ceasing to be a provincial of the supranational, and a political-aesthetic commentary on the most narrowly circumscribed events in the age of neocolonialism was necessarily a contribution to any understanding of global politics and aesthetics. This confrontation between Cortázar and Arguedas evokes Walter Benjamin's distinction between two irreconcilable kinds of storyteller: one who remains at home to pass on existing traditions and comment on their transformations, and one who travels abroad in order to send back reports on foreign affairs, pointing to their importance for understanding developing local events ("Storyteller"). Notably, in this discussion of point-of-view framing and articulation, poetry is afforded very little place, which suggests that in the 1960s-just as today-the aesthetic of lyric poetry was thought to have little to say about or contribute to political discourse. However, it does make an oblique appearance in Arguedas's last diary, where he glosses an observation on the closing of a literary cycle in Peru with the elliptical statement "Vallejo era el principio y el fin" (Vallejo was the beginning and the end) (246). What Vallejo appears to represent for Arguedas, here and in comments elsewhere, is the fullest articulation of a critical and historicized local identity at a particularly strained moment, giving voice to a Peru being pushed into modernity while struggling to reconnect with its precolonial past. Arguedas's reading of Vallejo has had many echoes among later critics, who have understood Vallejo's poetry to be the voice of the local as it enters into tense contact with international modernity. Yet I will be arguing throughout this book, in what may itself be a polemical vein, that Vallejo occupies a position equidistant from both Cortázar's somewhat airy cosmopolitanism and Arguedas's agonizing localism. Vallejo's critical and self-critical perspectives on both the local and the global are far less consistent than one might expect, and they determinedly work against the articulation of a fixed and constrained viewpoint. Rather than aligning himself with either Peru or the West, his commitment is to multiple and constantly shifting attachments, which are those of his reading and experiential horizons-diasporic Peruvianism, the international avant-gardes, Soviet politics, Harlem Renaissance aesthetics, Spanish antifascism, to name just a few. In a gloss on Arguedas's retort to Cortázar-cited as the epigraph to this section-I will be proposing that we consider Vallejo as a "provincial of the world," tethered neither to the local (speaking exclusively to, of, and from Peru) nor to a denationalized universalism (as in Casanova's reading of Beckett ) but rather tied to the world ("atado al globo," as he puts it in the early poem "Huaco"), about and to which he speaks from a localized position which is nonetheless constantly on the move. Born in 1892, Vallejo was raised as a Spanish speaker in the small Andean town of Santiago de Chuco. He studied literature and then law in the coastal city of Trujillo and in the capital city of Lima, taking up work as a schoolteacher in both cities, eking out an existence among their local bohemias; he famously spent three months in jail for allegedly instigating a skirmish that took place during a visit to his hometown. During this period, he published two collections of poetry-Los heraldos negros (The Black Heralds) (1919) and Trilce (1922)-which went almost completely ignored, eliciting little more than a few jibes from the cultural establishment. In the face of this apparent failure and chased by a lingering arrest warrant, Vallejo set sail for Paris in 1923, where he lived-with a short period of exile in Madrid in 1932 due to his political activities-until his death in 1938, never returning to Peru, despite sporadic attempts to do so. Through the late 1920s he earned a meager living as Paris correspondent for various Peruvian newspapers-for which he was rarely paid-while supplementing his income by means of a law scholarship, occasional translations, and work as tutor to the children of visiting dignitaries. His connection to Peru reasserted itself momentarily in the mid-1920s, when he found himself alluded to in two intersecting debates at home: the indigenism polemic, which focused on the proper forms of local representation (Aquézolo Castro), and a polemic over the avant-garde, split between politics and aesthetics, involving a broader international dimension (Lauer, Polémica). Nonetheless, he resisted inscription in either one, turning his attention instead to artistic debates taking place in Paris, to broader commentaries on modernity and geopolitics, and to a developing interest in Marxism, beginning in the late 1920s and persisting-or fluctuating-through to the Spanish Civil War in 1936-38, until his death from a still-unidentified illness. Vallejo published only five poems during his Paris years, although we know that he composed at least forty-seven undated poems between 1923 and 1936. A final burst of poetry under the impact of the Spanish Civil War in late 1937 produced sixty-seven more poems, almost all of them carefully dated by month and day. Fifteen of these were shaped by the poet into the collection España, aparta de mí este cáliz (Spain, Take This Cup from Me), published by Republican soldiers in 1939. The remainder were organized and published posthumously by subsequent editors under several controversial titles, with Poemas humanos (Human Poems) being the first (Paris, 1939; ed. Georgette Philippart de Vallejo and Raúl Porras Barrenechea) and the most durable. During his Paris years, Vallejo also produced a novel, El Tungsteno (Tungsten) (1931); a commissioned novella, Paco Yunque, rejected as being "too sad"; two "Incan" stories published in Spanish magazines; a series of reports on his visits to the Soviet Union, some of which were published-to great success-as Rusia en 1931, while others remained unpublished under the title Rusia ante el segundo plan quinquenal (Russia before the Second Five-Year Plan); two notebooks containing jottings on aesthetics, Contra el secreto profesional (Against the Professional Secret) and El arte y la revolución (Art and Revolution); a series of never-staged plays; and two screenplays, also never produced. My focus in this book is restricted to Vallejo's lyric and journalistic writings, treating the latter as a hinge between his earlier and later poetry. As I will argue, Vallejo's poetry and journalism both offer an agonizingly tense but also exhilarating performance of an ongoing struggle with the central and the marginal questions of modernity, influenced by his readings and eventually his residence in two markedly different contexts: Peru and Paris. The diverse makeup of the different towns and cities in which Vallejo lived in Peru, the time it took for texts to arrive from abroad, and his ongoing fraught relationships with contemporary writers and critics of conservative, avant-garde, and indigenist stripes mean that to read his poetry and prose in a Peruvian context already imposes a prismatic frame. Similarly, Vallejo's residence in Paris in the 1920s and 1930s-heyday of international modernism in its passage from aesthetic experiment to political commitment-must be measured against more familiar narratives of writers' lives in the capital of literary modernity. Vallejo moved to Paris only to take up a marginal position at the center: writing poetry that went unpublished and chronicles for Peruvian newspapers that he feared were going largely unread, about experiences that were most likely secondhand, derived from his own readings of Parisian newspapers and his eavesdropping in cafés. In this sense, as both poet and journalist, he was folded into metropolitan modernity while remaining invisible within it. Attending to that inside-outside position, which is paradigmatic for many modern writers, allows us to expose the gaps in usual narratives of international modernism while adding nuance to readings of those writers who operate-to follow Pascale Casanova's valuable point ("Literature" 81)-in two different cultural panoramas at once. One of the driving forces behind this book is my conviction that Vallejo deserves to be-indeed must be-read in relation to the multiple contexts in which he lived, read, thought, and wrote; contexts that place important constraints on his writing but that also give it its peculiar and volatile texture. Vallejo's sense of being out of place both at home and abroad, of appealing to different and potentially indifferent audiences, sometimes produces uncomfortable-even discomforting-shifts in his writing. But rather than smoothing these out to provide a cohesive narrative of ideological or aesthetic consistency, we should ask what they might mean for broader theoretical questions about the relation between politics and aesthetics, between history and literary genres, in the modernist period. In Vallejo's case, as I hope will become clear, it is helpful to think about affiliations rather than filiations (Said, World 174-75), paying attention to what he connects his own writing to rather than what it directly descends from, and tracing the tensions that these affiliations entail. We also need to recognize the debates in which he resisted participating-in other words, listen to the silences as well as the sounds of his writing. The writer and modern subject, as Vallejo intimates throughout his poetry and prose, cannot simply adopt a position or take one as a given-with an unquestioned grounding in ethnicity, heritage, gender, class, and so on-but rather works and lives in situated conditions of self-critique and self-correction. This commitment to momentary yet full-bodied attachment renders the writer's position precarious but also productive: it may be difficult to speak of a program in Vallejo's poetry, yet its lack of a coherent agenda is, paradoxically, a sign of its sustained commitment to critical thought. I will be arguing that Vallejo's poetry is most theoretically, politically, and aesthetically challenging at the moments when it seems most intransigent, when it slips our-and sometimes its own-grasp. Occasionally, coherence is to be found where we least expect it. In the late 1920s Vallejo produced three separate articles that appear to be on unconnected, even incompatible topics: the avant-gardes ("Poesía nueva" [New Poetry], 1926; ACC I: 300-301), indigenism ("Los escollos de siempre" [The Usual Stumbling Blocks], 1927; ACC I: 495-96), and socialism ("Ejecutoria del arte socialista" [Final Judgment on Socialist Art], 1928; ACC II: 652-53). All three of these articles, however, are articulated around the same central axis: the openness of the body to historical experience and the production of responsive gestures through a sensorium subjected to constant retraining. Rather than rejecting modernity-as the "new poetry" article in particular has been read-Vallejo offers images for its incorporation; modern subjectivity and self-positioning are here less a question of lip service than of bodily processing. This is at once a physiological and a radically historicist argument, and it implies a continuity between all three concerns-indigenism, socialism, the avant-garde-in Vallejo's writing: a self-positioning that entails an alignment of body and mind, an aesthetics and politics of full-bodied adhesion, within an enfolding panorama of contemporary urgencies, dictates, and constraints. As I will argue throughout this book, Vallejo's concern is to give poetry and politics back their bodies, and thereby to extend the sense and reach of the lyric. These three topics, moreover, correspond to the three frames through which Vallejo's poetry tends to be read, often mapped onto the three distinct blocks of his lyric writing: indigenism and Los heraldos negros (1919), the avant-garde and Trilce (1922), socialism and the posthumous poetry (composed between 1923 and 1938). First-time readers may associate Vallejo in advance with avant-garde experimentation, which has been the focus of some dazzling close readings (Coyné; Paoli; Ortega); others likely have a sense of his ideological connection to either indigenism or international Marxism. The interest in reading Vallejo as a localist or indigenist poet, which began with his contemporaries (Orrego; Mariátegui), has proven markedly resilient; in recent years it has led to highly nuanced commentaries on his relation to Peruvian history (Cornejo Polar; Mazzotti). More recently still, Vallejo's iconicity as a Marxist poet has gained particular traction with his international readers, as a new exemplar for political poetry in the fraught moment of the 1930s (Lambie; Dawes). Both of these latter readings have great power and merit, but both occasionally run the risk of oversimplifying Vallejo's own historically shifting positions-which, moreover, take markedly different forms in his poetry and prose-not to mention side-stepping the deliberate difficulty of his poetry. I will be arguing that Vallejo offers a more complicated take on the writer's relation to history-local and international-and on the lyric's relation to politics than either of these perspectives allow. I want to tease out this question from the outset by looking at a poem that ostensibly weaves the two concerns together. "Telúrica y magnética" (Telluric and Magnetic) is one of a series of poems that Vallejo wrote in the early 1930s, at the apex of his commitment to Marxism. Those poems focus on what we might call "local universals"-figures linked to specific geopolitical economies, presented as exemplars for a new transnational historical agency-and they emblematize Vallejo's faith in the capacity of the working classes to seize hold of their own destiny and set off a revolutionary chain reaction of revolution, "con efecto mundial de vela que se enciende" (with the universal effect of a candle that catches fire), as he puts it in "Gleba" (Glebe). Among these figures were-unsurprisingly-Bolsheviks but also industrial and agricultural workers of indeterminate nationality, the unemployed (physically located in Europe but abandoned by their national systems), and miners, linked to the neocolonial sites of extraction with which Vallejo was familiar from Peru. Although all of these figures are related to labor and hence to the body, the poems in which they appear restore an immense and immediate power to speech-but not, significantly, to the speech of the poet. As Jean Franco noted in her pioneering study of Vallejo (Dialectics 172), the poet's own words in these poems are halting, self-questioning, self-ironizing; conversely, the laboring figures he apostrophizes "hablan como les vienen las palabras" (speak as the words come; "Gleba"), suggesting that unmediated access to language comes through the body, in a rehearsal of the ongoing debate about the virtues of manual over intellectual labor. ¡Surcos inteligentes; ejemplo: el monolito y su cortejo! ¡Papales, cebadales, alfalfares, cosa buena! las aguas con su sorda antigüedad! tropieza con la técnica del cielo! y sentimiento oceánico de todo! ¡Oh climas encontrados dentro del oro, listos! con religión, con campo, con patitos! y en verso cuando páranse! ¡Roedores que miran con sentimiento judicial en torno! ¡Oh patrióticos asnos de mi vida! nacional y graciosa de mi mono! y que por eso acato, subiendo por la idea a mi osamenta! y del que descolgaron de la barreta espléndida! aves por un descuido de la cresta! con el bravo rocoto de los temples! al tronco feliz y al tallo competente! para salvar al roble y hundirlo en buena ley! y Perú al pie del orbe; yo me adhiero! de un solo sombrerazo, mis diez templos! ¡Brazo de siembra, bájate, y a pie! y la tórtola corta en tres su trino! ¡Indio después del hombre y antes de él! y me doy a entender en una quena! As Franco notes (173), this poem originally began as a lyric engagement with Marxism, an attempt to deal poetically with abstract questions of theory and praxis by applying them to rural labor (the original title was to be "Meditación agrícola," "Agricultural Meditation"). When Vallejo revisited the poem, most likely in 1937, he reworked and radically expanded it to include Peruvian elements, which has led to its consecration as one of the most explicit meditations in his work on Peru. Not locally circumscribed, however, but connected to the world-"Perú del mundo, / y Perú al pie del orbe" (Peru of the world, / and Peru at the foot of the globe)-and to which the poet significantly declares his allegiance instead of taking or presenting it as a given. In its final form, the poem offers a catalog of elements populating or constituting the Peruvian soil and national sense; its constant exclamations (a total of thirty-four that make up the poem's sixty-three lines) create an effect of celebration, directly mimicking the modes of nineteenth-century neoclassical poems, which listed the contents of Latin America for locals and foreigners alike, such as Andrés Bello's 1826 "Silva a la agricultura de la zona tórrida" (Silva to the Agriculture of the Torrid Zone). The only line that deviates from this grammatical structure is a question encased in a parenthesis halfway through the poem: ("¿Cóndores? ¡Me friegan los cóndores!" [Condors? Screw the condors!]). But why the parenthesis? To whom is the speaker implicitly responding? And why would his interlocutor have questioned the absence of condors? This sudden and parenthetical self-interruption shifts the poem in a direction other than that of simple celebration: instead, it points to the pressure to produce recognizable stereotypes, whether for a local or a foreign eye, and this almost imperceptibly turns the poem into a kind of anti-Baedeker, frustrating the expectations of tourist and nationalist alike. and I make myself understood on a quena! As part of this by turns feckless and focused lyric treatise on the local-global, the poem works together lists of recognizable words from political discourse and from Peruvian scenery, blending elevated tones and terms with bathetic emotions and language, inflecting Romantic discourses on the sublime with some of the buzzwords of contemporary discussion ("oceanic feeling" is taken from Freud's 1930 Civilization and Its Discontents). But rather than enfolding the reader in a harmonic performance of Peru's consonance with the world and poetry's consonance with political imperatives, these dissonances send the reader lurching through a sequence of clashing chords. What at first sight seemed like a successful meshing of Marxism and indigenism thus becomes a much more unstable performance of a meditation on the local and the poet's responsibility to it, involving tensions not only between the individual elements of its catalog but also between those elements and the poem's overarching tone. If we pay sufficient heed to the charge of those exclamations, they end up ironizing themselves and exhausting our attention; but if we bypass the question of tone, we miss the complications of the poem's "statements." This quandary, I will suggest, is emblematic of Vallejo's poetry. His writing requires that we pay inordinate attention not only to the contents of poems but also to their form and tone, and to the possible disharmonies between them; and these disharmonies offer a much richer and more demanding image of the relation between the poet, his subjects and objects, and history. Vallejo's poems, as I argue throughout this book, never cease to reach toward their surrounding situations, but at the same time they incessantly question the reach of poetry, and they resist offering compensatory aesthetic images to counterbalance the violence of their social environments; his poems are always more attentive to parts than to wholes, to broken metonymies than to integrative metaphors. While this might seem a primarily aesthetic question, it is related to much larger questions of political representation. In his early poetry, as I argue in chapters 2 and 3, Vallejo relentlessly breaks discourses and bodies down into their constituent parts, bringing discussions of proper language (whether lyric or political) and of adequate representation back to their material bases while undercutting the demand that poetic discourse or national landscapes easily yield up their contents. And in his later poetry, as I discuss in chapter 6, this question becomes more directly related to the constituency of political subjectivities. Vallejo's Paris poems, I will suggest, attempt to hold the individual (the part) and the collective (the whole) in view simultaneously, and to consider them in their enmeshment, offering a willfully excessive lyric supplement to reductive political discourse. The relation between parts and wholes that structures this poetry is therefore a concern of the lyric-the elements that make it up, but which, in their interplay, can undermine its utterances-but also of politics, as Vallejo's poetry enacts its own deliberately difficult inscription in local and international history. If in his Paris years Vallejo began to sense that the subjective nature of the lyric no longer lent itself to public address, he was not completely prepared to accept the extinction of the lyric subject-and with it, of subjectivity tout court. He held out a lingering hope that poetry might find a way to coexist with politics, without fully extinguishing the peculiarities of its own voice. He therefore continued to compose poems sporadically through the late 1920s and early 1930s, although he refrained from publishing them, for reasons I explore in chapter 4. And as he mapped out various ways for the lyric to harness the voices of its time without losing its own, Vallejo's poetry stood as a contrapuntal private discourse to his prose writings-journalistic articles in Latin American and European newspapers, discussed in chapter 5-meant for a public. Vallejo alluded to this implicit dialogue through his revision of "Telúrica y magnética." In its first version, the line "Paquidermos en prosa cuando pasan" (Pachyderms in prose when passing) stood alone, but the revised version adds "y en verso cuando páranse" (and in poetry when standing still; my trans.). If prose walks alongside history, poetry attempts to interrupt it-resisting the march of history, yet still consciously inscribed within it. Vallejo wrote throughout his career from a position of marginality: first in a Peruvian context that tended to sideline poetry in favor of more aggressive prose and later as a Latin American in Paris, writing newspaper chronicles in Spanish with three different audiences in mind-Peruvian readers at home, his avant-garde contemporaries in Paris, and the man on the street. This triptych performance, coupled with the radical difficulties of his poetry, makes him a particularly compelling case for rethinking the modes of international modernism in the interwar years. But it also keeps him current. The growing sense of Vallejo's significance for contemporary relations between poetry and politics was signaled in Garrett Keizer's October 2007 lead article in Harper's Magazine, which quite remarkably used Vallejo's work-and specifically the line "Hay, hermanos, muchísimo que hacer" (There is, brothers, much too much to do) from the poem "Los nueve monstrous" (The Nine Monsters)-to present a call to action in a moment of political suspension. But how do we do justice to a poet who was rarely read and little understood in his own lifetime, who has been read too easily in the intervening years as an exemplar of Peruvian representational aesthetics and politics, and who is just beginning to emerge in Anglophone and other contexts as shedding new light on international modernism while connecting to contemporary reflections on the lyric? In Latin America Vallejo has long been considered one of the most significant poets of the past century; nonetheless, the difficulty of his writing and his appropriation for Peruvian cultural politics have meant that studies of his work have largely appeared in Spanish and restricted him to a bounded local context. Moreover, formalist exegeses of his work over the past half century have only sporadically connected Vallejo's writing to larger modernist or avant-garde debates. Despite many nuanced considerations of his recasting of Spanish-language poetry, there has been little reflection on his importance for the broader panorama of lyric theory and practice in the West. In general, the major tendency in Vallejo criticism has been to view him as exceptional, cut off from any context that might explain his development. In this book, conversely, I aim to open a new paradigm for reading his poetry and journalism by relating them directly to the work of other Peruvian, Latin American, and European writers and theorists, showing Vallejo's constant and conscientious dialogue with a broad discursive and material context. Examining his convergence and divergence with some of the central tenets of the international avant-gardes, while underlining his coincidence with better-known writers such as Walter Benjamin, James Joyce, and Georges Bataille, I hope to make Vallejo available to a wider audience and to foreground the potential of his poetic thought on politics and aesthetics in modernity. Vallejo's poetry and prose, as I demonstrate through close reading, cultural-historical analysis, and theoretical inquiry, is critically connected to debates within the Latin American and international avant-gardes, on which it sheds important new lights; but it also opens itself up to the present, to current theoretical investigations of the relation between aesthetics and politics, offering new angles for viewing the place and reach of the lyric. My six chapters probe the range of interlocking reflections in Vallejo's writings on the lyric, local and international history, and the ethics of bodies and languages; they aim to explain and expand the historical and theoretical contexts in which Vallejo can be read, arguing through his example for poetry's capacity to grapple with questions of absolute contemporaneity. 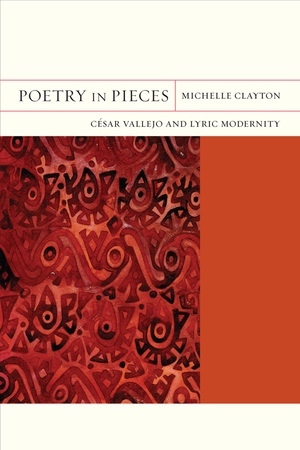 Poetry in Pieces follows a chronological trajectory through Vallejo's writings, from his two Peruvian poetry collections, the modernist/indigenist Los heraldos negros and the intransigently avant-garde Trilce, to his two posthumous collections, Poemas humanos and España, aparta de mí este cáliz. The hinge between the two periods is formed by Vallejo's newspaper chronicles of 1923-36, written in Paris for a Peruvian audience. These chronicles have received very little critical attention and have rarely been used to shed light on his poetry, despite the fact that they map a crucial passage in Vallejo's thought from an emphasis on language to a focus on bodies, moving into a full-blown analysis of capitalism as a time-out-of-joint. Moreover, Vallejo's account of Paris in the 1920s and 1930s offers a crucial corrective to triumphalist narratives of modernist or avant-garde developments in the capital of cosmopolitan culture. Taken together, his poetry and prose can be seen not only to explore and go beyond the options available to a writer from a peripheral location in a moment of high modernism and avant-garde dislocations; they also elaborate reflections on transnational culture-and the relation within it of poetry and politics-during a period of geopolitical reconfiguration, striated by hierarchies of race, class, and language. Vallejo's insistent positioning of the lyric subject as a contingently located social subject produces a self-critical poetics of resistance, transformation, and potentiality. His poetry and prose, in short, are crucial for rethinking modernism from the outside and from below; their defiant cultural and class marginality operate not as a restriction but as an opening to new views of the modern. My first chapter, "'Pachyderms in Poetry and Prose,'" tracks the emergence of Vallejo's early poetry from a series of debates in turn-of-the-century Peru between poetry and prose, conservative and critical nationalisms, localism and internationalism. Vallejo's work, like that of many of his fellow Peruvian writers, can be read as a projection of willed contemporaneity with the West, his aim being to produce not modern but contemporary writing, as a mode of transcending uneven modernization in Latin America. And in practical terms, what was contemporary with his writing were not just local politics but the international avant-gardes, which circulated rapidly through Latin America. By examining the different forms of temporality and spatiality offered by those avant-gardes, and the responses they generated among a variety of poets and critics up to Vallejo, I track Latin American poetry's shift early in the century from anachronism or timelessness toward a committed contemporaneity. In my second chapter, "Invasion of the Lyric," I examine the contortions of language in Vallejo's first two collections of poetry, Los heraldos negros and Trilce. What both collections present, I suggest, is the corrosion of the lyric by a growing sense of linguistic estrangement and its invasion by the heterogeneous voices and discourses of modernity. Vallejo initially emphasizes the degradation of the language used to capture public and private feelings, but what gradually takes the place of lyric refinement in his poetry is an aesthetic of the robustly material, of the sensorial bases of experience. And where Vallejo crucially diverges from other Latin American and international avant-gardes is in his shift away from sight toward sound, smell, taste, and touch. This radical recasting of the poet's relation to the outside world ushers in a productively estranged relation to lyric language; the movement from Los heraldos negros to Trilce can be seen as Vallejo's process of unlearning language in order to revitalize the poetic utterance. Vallejo's early poetry deliberately incorporates orality, colloquialisms, and linguistic mistakes; it reconciles indigenism and the avant-garde, both of which sought to make room for new utterances; and it profits from being read alongside statements and practices by a range of Peruvian and Western writers-from Cubist poetry and Dada performances to Latin American experiments with vernacular culture. Further, Vallejo's poetry increasingly unveils the extent to which lyric and social subjects alike are spoken through by other voices; poetry is here not the private utterance of a reflective lyric voice but a response and an address to an outside. His poetry, I argue, takes conversation as its covert model, ushering in a new conception of the lyric: no longer the self-contained statement of an individual speaker, but an opening up to the world's voices, which implode into the poetry's fragmented utterances. And as I argue at the close of this chapter, Vallejo's project is not just the incorporation of multiple voices into poetry; it is the full installation of the body in the lyric, a reconnection of language to sensory experience. In Trilce, everything moves through the body, and the body itself is constantly irrupting into the poetry, interrupting the lyric with cries of pleasure or pain, images of physical abasement and excitement. My third chapter, "Lyric Matters," explores the representational practices of Vallejo's second collection of poetry. Trilce, I suggest, offers a simultaneous dismantling and recasting of representation, following three distinct yet interwoven modes. The first involves an onslaught on symbolist modes of representation, rejecting conventional practices of metaphorical transubstantiation in favor of a metonymic poetics of contiguity, in which the figurative is frequently displaced by the literal, metaphors are brought back to their material bases, and elements rub up against one another, exchanging some of their properties in the process. The second mode agilely parries the demand that Latin American poetry yield up its local referents in an easily usable form, presenting instead a transformed poetics of the oblique, the mixed, and the fragmentary. The third undertakes the incorporation of waste, of absence, of nonvalue and negativity into a lyrical rethinking of presence and potentiality. All three approaches involve techniques of fragmentation, of circulation, and of transformation, and all three resist the temptation to mimic economic practices of producing raw materials for consumption abroad. At the same time, they upset even the most radical European and Latin American practices of fragmented representation; displaying no nostalgia for wholeness, Trilce proposes a peculiar poetics of matter that condenses a new kind of lyric investment in history, as well as an oblique inscription of history in the lyric. The connection to history appears on one level through the representation of even the most humdrum or grotesque of bodily activities, which finds important analogues in writings by Joyce and Bataille. But the question of representation is given an extra charge in Vallejo's poetry by reference to the primitivist exploits of the international avant-gardes, to cultural and socioeconomic plundering by Western powers, and to mismanagement of national resources. The key element that condenses these reflections is guano: at once material and metaphorical, it ties together a national past and the present remnants of its bankruptcy, alluding to the most ignominious productions of the body and functioning as matter given over to a future, producing new elements from the soil in which it is invested. By referencing guano in an avant-garde collection often read as hermetically sealed, Vallejo formally works history into the lyric, exploiting poetry's untapped potential for mining socioeconomic matter while resisting the temptation to produce facilely reflective writing. In 1923 Vallejo moved to Paris, partly to escape an arrest warrant, partly to experience metropolitan modernity. While acquainting himself with European debates over aesthetics and politics, he remained attentive to debates developing back in Peru. These latter debates became condensed in a mid-1920s polemic setting indigenism (a project of local recovery and representation) against the avant-garde (connected to contemporary international experiment). My fourth chapter, "Lyric Technique, Aesthetic Politics," reads Vallejo's reluctance to continue publishing poetry against the backdrop of these interlocking debates. The answer, I contend, lies in his failed attempts to produce a theory of his own poetic technique that would satisfactorily entwine his aesthetic practice with his growing political commitment. This dilemma comes into sharper relief when his sporadic theoretical writings are compared with those of his contemporary José Carlos Mariátegui, who in those same years was producing provocative readings of the international and local avant-gardes but also problematically restrictive readings of Vallejo's poetry. This chapter therefore reads these two writers contrapuntally, comparing their responses to one another, to the unfolding panorama of interwar aesthetic politics, and to the increasingly attractive medium of film, whose redemptive promise was epitomized for both in the figure of Chaplin. My fifth chapter, "New World Views," studies Vallejo's wide-ranging journalistic articles, written from Paris for newspapers in Peru between 1923 and 1930. These articles offer critical reflections on modernity and its explanatory discourses, unveiling the breakdown of physical and linguistic communication across classes, races, cultures, and nations within a rapidly transforming geopolitical scene. Lacking the means and the language skills to participate fully in cosmopolitan culture, Vallejo inhabited Paris as an anti-flâneur, using his chronicles to foreground the material bases of cultural and political praxis that denied a variety of potential participants-himself included-full access to modernity; his prose writings thus expose the underbelly of what we tend to think of as the apotheosis of transnational modernism in interwar Paris, demanding that we consider its submerged layers alongside its surface flourishes. Finding himself excluded from the Parisian feast, Vallejo produces parodic ethnographic reports on international modernity, revealing the pressures placed on both bodies and languages by interwar geopolitics and by cultural and social striation. This chapter charts the ways in which Vallejo shifts from speaking as a Peruvian and/or Latin American viewing Paris and broader international culture and politics from the outside, to a series of temporary affiliations with oppositional models of culture: black theater in Paris, Soviet experiments, and the common passerby or transeúnte. I trace his zigzagging commentary on the semiotics of modernity and its structuring discourses, a commentary that provides a crucial counterpart to writings by the Frankfurt school and by the surrealists; Vallejo's reflections on fashion, sport, science, theater, and film cut their way through international modern culture from outside and from below. His critique, I argue, takes place not just through content but also through form. Parodically mimicking the journalistic modes of the period, which knitted together all aspects of the modern to provide an image of interlocking coherence, Vallejo's chronicles press the jaggedness of montage into the service of ironic contrast; his virtually filmic writings set clashing images from the modern scene alongside one another to reveal the divergent ways in which urban modernity is experienced by subjects from different classes and cultures. It is unsurprising, then, that Vallejo should have found one of the only possibilities of redemption in silent film: in the playful movements of Chaplin, and in the interplay between different filmic techniques, he located glimmers of new representational practices, with the potential to reach across classes and cultures to produce a critical spectator-and ultimately an actor or agent-of the modern. Vallejo's exile in the capital of avant-garde culture undercut his own avant-garde leanings, moving him toward an awareness of the need for communication, critique, empathy, and resistance-concerns that threw the notion of poetry's reach into crisis. My sixth chapter, "Making Poetry History," examines Vallejo's posthumously published and tentatively titled collection Poemas humanos, composed sporadically from the mid-1920s to 1936 and completed in a final burst of poetic activity in late 1937. If Vallejo's prose insisted on taking note of the economic underpinnings and exclusions of culture, his poetry reattaches economics to subjectivity, emphatically focusing on the place of the individual within collectivities. It thereby offers a critique of modern political modes but also of systems of civil discourse, which attempted to organize individuals into productive political bodies while canceling their residual needs and desires. And while parodying these nonlyric discourses, Vallejo undercuts the presumptions of poetry itself, resisting the temptation to offer facile representations of modernity's mass subjects. But in attempting to make room for the bodies and voices of his fellow modern men, Vallejo also registers his anxiety over the potential erasure of the lyric voice; this late poetry offers a relentlessly self-critical analysis of the possibilities of lyric engagement, without entirely canceling out the category or possibilities of poetry. And it does all this with a remarkably light but also formally complex touch, in the interminable and chaotic lists that tend to structure these late poems, which are more heterogeneous and often flat-out funnier than critics have suggested. Vallejo's model in this respect, I argue, was not contemporary poetry but film, and his teeming, haywire poems draw insistently on the latter's dual techniques of montage and slapstick. Folded into Poemas humanos is the self-contained Spanish Civil War sequence España, aparta de mí este cáliz, written in the last three months of 1937; its composition alternated with that of poems which remained part of the larger volume. Poemas humanos and España, aparta de mí este cáliz have always been treated in isolation, due to the apparent universalism of the first and the radically historical and located utterances of the second. Nonetheless, the unusually careful dating of each composition (Vallejo sometimes produced a poem for each collection on a single day) signals a conscious experimentation with different forms of the lyric; not only does Vallejo unexpectedly return to poetry in order to engage with contemporary historical events, but in that return, he maps out two critically divergent modes of poetry's engagement with history. I therefore consider the two collections in their interrelations, exploring their new configurations of bodies and voices in contingent connection to specific historical moments, and tracing the interplay of aesthetics and politics in Vallejo's evolving sense of the reach of the lyric. This late poetry pushes Vallejo's earlier contrast between metaphor and metonymy into a reflection on politics and the material bases of modern collective life; his play with fragmented bodies issues into a large-scale commentary on the striation of the body politic, and on the strivings of language within it to articulate new possibilities of individual and collective utterance. At the same time, España, aparta de mí este cáliz sets the utterances of the poet against both the incommensurability of a critical geopolitical juncture and the popular articulations of struggling bodies in the Spanish Civil War, implicitly repeating Friedrich Hölderlin's question, "what are poets for in a time of dearth?" This question, I suggest, subtends Vallejo's entire body of work, and its varying articulations-organized around the place of bodies and language in poetry-makes him a crucial addition to our understanding of the modern lyric. 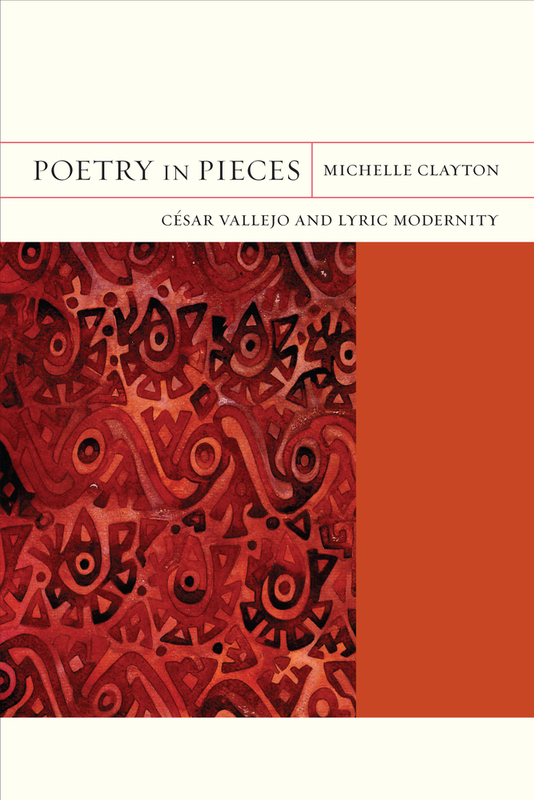 Set against the cultural and political backdrop of interwar Europe and the Americas, Poetry in Pieces is the first major study of the Peruvian poet César Vallejo (1892–1938) to appear in English in more than thirty years. Vallejo lived and wrote in two distinct settings—Peru and Paris—which were continually crisscrossed by new developments in aesthetics, politics, and practices of everyday life; his poetry and prose therefore need to be read in connection with modernity in all its forms and spaces. Michelle Clayton combines close readings of Vallejo’s writings with cultural, historical, and theoretical analysis, connecting Vallejo—and Latin American poetry—to the broader panorama of international modernism and the avant-garde, and to writers and artists such as Rainer Maria Rilke, James Joyce, Georges Bataille, and Charlie Chaplin. Poetry in Pieces sheds new light on one of the key figures in twentieth-century Latin American literature, while exploring ways of rethinking the parameters of international lyric modernity. Michelle Clayton is Associate Professor of Comparative Literature and Spanish and Portuguese at the University of California, Los Angeles.